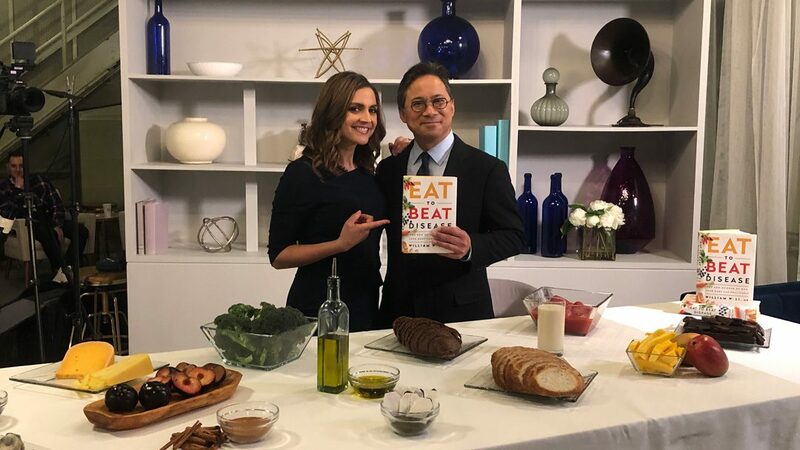 Today, Dr. William Li shared insights from his new book EAT TO BEAT DISEASE – The New Science of How Your Body Can Heal Itself (Grand Central Publishing/Hachette) in an interview with “Good Morning America.” Dr. Li said we have underestimated the role that the foods we eat can play in preventing disease. Plus, he shares his top five foods to go for the next time you hit up the supermarket. Watch the full interview here. EAT TO BEAT DISEASE gives readers a fascinating view of the body’s health defense systems, which span angiogenesis, regeneration, microbiome, DNA protection, and immunity. Each system helps the body resist disease, and they can be activated by foods, according to Li. In the book, Li identifies more than 200 foods that improve health defense functions, and the information is richly supported by more than 600 peer-reviewed scientific references from researchers around the world. EAT TO BEAT DISEASE describes the evidence behind how food can help combat cardiovascular diseases, diabetes, dementia, autoimmune conditions, and even cancer. EAT TO BEAT DISEASE is available wherever books are sold.